The installation consists of two independent curved walls, each 8 ft. x 8 ft. set up on 10 ft. x 10 ft. of floor, set with a curved backlit transparency on each wall. The two images that comprise the entry SAND are frames from a 3D computer film currently in progress. Exhibiting them as still images gives us the opportunity to focus attention on their content as metaphor. Although all the objects in the scene are synthetic, they are wrapped with textures that were digitally scanned from actual rocks and sand. Taken out of context from the film, the view of the beach is a meditative image in which time, represented by the lapping water on the shore, stands still. The under-the-surface image immerses viewers in a moment in time and place where our human bodies cannot usually go. The SAND scene used to create the beach image has 850 mod­els of pebbles and 125,00 triangles. The scene used for the under-the-surface image has 400 models of pebbles and 150,000 triangles. 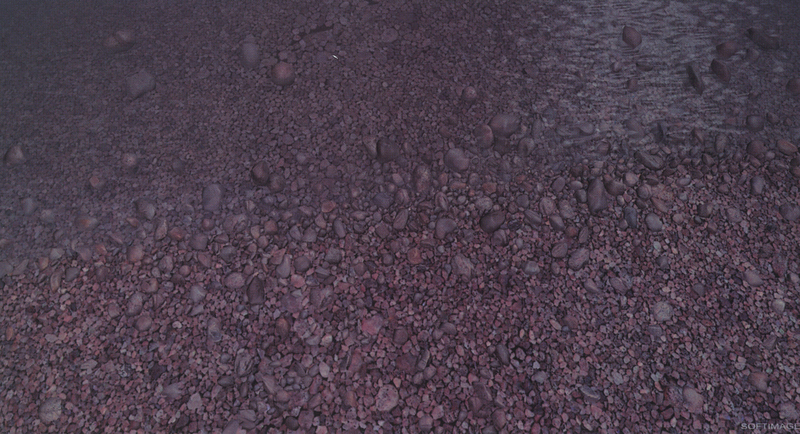 Both scenes contain multiple lights and raytraced shadows, transparency, reflection, refraction, and fog-as well as texture maps digitally scanned from actual rocks and sand. The deformation effect visible in the under­the-surface image was created with refrac­tion. All modelling, animation and materi­al definition were accomplished interac­tively with the 3D animation software SOFTIMAGE.